Hearty grain salads are a staple in our house, and this one hits all the right notes with slightly bitter arugula, bright lemon, creamy feta and crunchy pistachios. Like most hearty whole grain salads, this one is quite versatile, so you could certainly use a different grain if you’d like. Barley, wheat berries or even freekeh would be great. And a different hearty green or nut will also work just fine. With savory recipes, I love cooking my grains with a bit of broth in addition to water for an extra boost of flavor. And if you’re not a big feta fan, feel free to swap in goat cheese, shaved Parmesan or ricotta salata. Add the farro, broth and water to a 2-quart heavy saucepan over medium heat and bring to a boil. Cover, reduce the heat and simmer until farro is tender and most of the liquid evaporates, about 25-30 minutes. If there is excess liquid after the farro is done cooking, simply strain it away. Let farro cool, then discard bay leaves. In a small bowl or mason jar, whisk together olive oil, lemon juice, shallot and a pinch of salt and pepper. Let sit for 10 minutes. 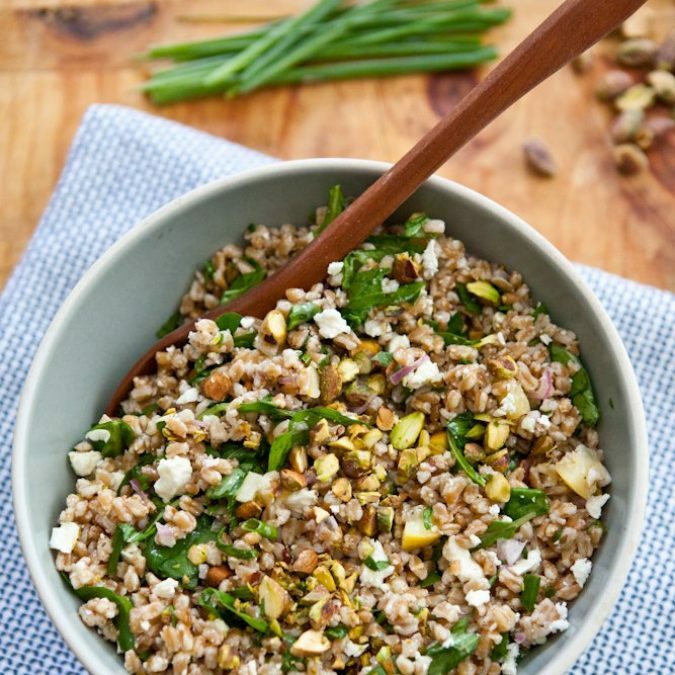 Meanwhile, add the cooked farro, arugula, 1/4 cup pistachios, preserved lemon and chives to a large salad bowl. Toss with the dressing. Taste and add additional salt and pepper if desired. Fold in the feta and top with remaining 1/4 cup pistachios. Serve room temperature or refrigerate, covered, for up to 4 days (bring to room temperature before serving).